Digital Detox is a digital agency finding new and innovative ways to present information and interact online. During its eight year tenancy at LSBU, the agency has benefited from a range of business development opportunities at the university, in particular the Investment Escalator programme. Agency founder Donovan Justice chose to base the agency’s office at LSBU because of the campus’s central London location and top quality facilities. He originally moved to LSBU’s Technopark in 2008 with a staff of four employees. Having expanded to 10 employees, the agency moved into a bigger space at the Clarence Centre for Enterprise and Innovation, LSBU’s award-wining hub of entrepreneurial activity, where tenants get access to a network of SMEs, events, training opportunities and venue hire. Through their tenancy at the Clarence Centre, the agency discovered LSBU’s Investment Escalator, a free programme for SMEs in London who want to grow. Funded by the European Regional Development Fund, the programme utilises LSBU’s industry-leading academic expertise to provide coaching, workshops and consulting in all aspects of business planning. “We know we’re not the experts in running our small business. We’re pretty good at digital design, development and delivery but in terms of running a business we appreciated that we needed to find help elsewhere. 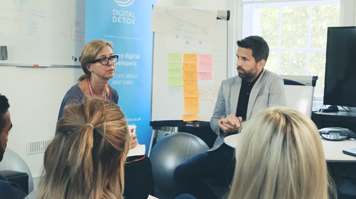 We thought the programme would be a good opportunity to develop the foundation of the business and help us grow,” said Liam Snelling, Programme Manager and COO at Digital Detox. In the first few months of the programme, Liam attended expert workshops on Business Effectiveness, Management Accounting and Employment Law. Subsequently, other staff attended workshops on Digital Marketing and PR. “The Investment Escalator helped us gain the skills we needed and find the right people who could help us address some of the areas where we could grow,” said Liam. Digital Detox also benefitted from the programme’s student consultancy strand. A 3rd year Accounting and Finance student assisted with setting up the agency’s financial processes, and group of BA Film Practice students produced two promotional videos for the agency’s client, Vodafone. “Through the Investment Escalator, we have developed and increased our network of contacts who can help small companies like us, both within LSBU and the wider business community,” said Liam. Since starting on the Investment Escalator, Digital Detox has secured product sales in new markets. The agency has also safeguarded seven jobs and created 15 new roles. At LSBU’s recommendation, the agency also hired MSc International Business student Maurice Schaaf to work part-time while he completed his studies. With LSBU’s help, the agency has outgrown its office space at the Clarence Centre and is now looking for larger offices. They hope to add a further 14 new positions within the next year.